The height of minimalist chic, the Lulu Real Leather Stool Black is a compact item that will sit proudly at any metropolitan breakfast bar. Lending your interior a sense of luxury without overwhelming the space, the Lulu is a supreme design for the home. 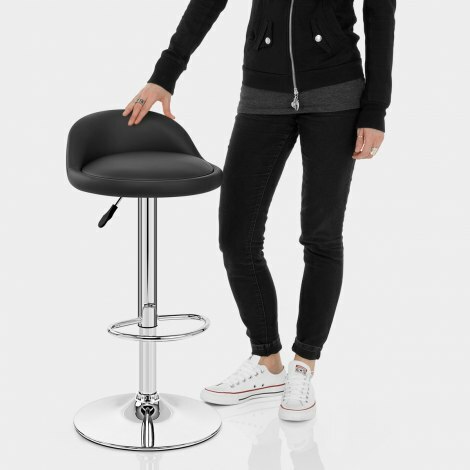 Super comfy, the stool is equipped with a seat upholstered in luxuriant black real leather. Dense foam padding makes up the body of the circular cushion, which is fringed by a low lip at the rear for added security. 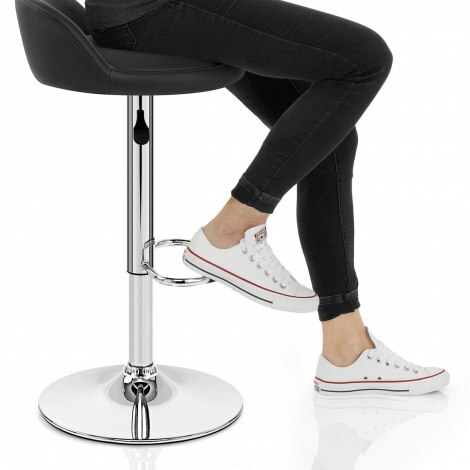 A chrome plated steel frame and the sturdy trumpeted base keeps the whole stool rigid. And, it has a circular pad beneath that helps to keep your floors in pristine condition, whilst above hovers a hand crafted, tubular steel footrest strategically placed for your comfort. A gas lift mechanism finishes off the package; providing variable height and 360 degree swivel and making access to any bar table or counter all the easier. "Fabulous compact real leather bar stools"
Bought these stools to match the colour scheme of my new kitchen. They are lovely and of really good quality. Very happy with them! The stools arrived in Dublin within two days. Exactly as the description on the website and were very easy to assemble. Overall they are very good value. Needed to replace bar stools we originally bought from Atlantic as one had broken - they no longer sold the original style so we looked for alternatives and spotted Lulu real leather stool and ordered three so they would match - was sceptical about them being real leather as have fallen foul of this from other companies - they are indeed real leather and extremely comfortable as well as looking very smart - Atlantic shipped very quickly after the order was placed - am very satisfied with this purchase. Very pleased with our new stools. Delivery was very quick and arrived on time. Easy to assemble with clear instructions.